A close look at the major socio-political indexes at this moment in time makes it clear that our country is in the throes of making its way across an epochal ridge. Not only because of the economic and financial crisis that has been underway for the last six years with its ensuing and unprecedented material and human tragedies (entrepreneurs who commit suicide, companies closing down overnight, workers with dependents who are laid off – when far away from retirement age – and are no longer able to find a job), but also because this year a political cycle came to a definitive end, and with it the epoch of passage between the First Republic (1948 – 1994) and the Second Republic, which represented that cycle for better and for worse. Dates as such don’t tell the whole story, but when we consider that in the none too distant past we have witnessed the demise, one after another, of the ‘big guns’ of our nation’s history – in addition to historical leaders of the Christian Democrats – reproachable for their actions in more ways than one, but never replaced as figures of institutional ‘weight’, from Francesco Cossiga (1928-2010) to Oscar Luigi Scalfaro (1918-2012), Emilio Colombo (1920-2013) and Giulio Andreotti (1919-2013), and we add to that the fact that the political project of Berlusconi (no matter what judgment we may wish to express) which had then inherited the consensus of Catholic-moderate voters also came to an end this year (above all due to sentences handed down by courts, but also partially due to reasons of age), the landscape we see before us “after the tempest” is quite distressing to say the least. Without engaging in polemics and looking at facts alone, the selfsame arrival in Palazzo Chigi (Prime Minister’s office) of an entire generation of people in their thirties (ministers and vice ministers), who to a great degree didn’t come up through the ranks in either the academies of political parties or the administrative offices of Montecitorio (Chamber of Deputies), constitutes further and evident certification of the crisis under way. Once again, therefore, responsibility for getting the country back on its feet falls on the shoulders of Catholic laypersons, who, if only pursuant to their vocation, ‘naturally’ hold most dearly to the common good, have always rejected ideological readings of situations, and constitute the most lively and pro-solidarity part of Italy. Beginning from these premises, reasoning about the crisis underway and recalling the seventieth anniversary of the last programme-oriented document of the Italian Catholic political class (the Camaldoli Code written back in 1943 at the renowned monastery in Arezzo), our Observatory proposes food for thought about the current situation, its challenges and its dramatic urgencies, with the introductory words penned by the President of the Observatory, Most Rev, Giampaolo Crepaldi: “Today it seems like things practically don’t add up anymore in Italy, and this despite top quality cultural and human resources. The canvas has become so unwoven that no one knows from whence the country’s recovery will begin. In the face of such a distressing picture and albeit hopeful for the many honest and industrious Italians, and the many believers who have conserved the awareness that their faith comes from far away, for some time Catholics have been unable to make an organic, unified, farsighted proposal clearly inspired by their tradition, their doctrine, including the Social Doctrine of the Church, and their faith; in brief, a Catholic proposal. They haven’t been able to do it, and haven’t been able to do it together. The difficulty certainly stems from the objective external picture, but, as always transpires in things like this, it stems all the more so from the weaknesses inside the Catholic world. Slothfulness is a moral and spiritual illness. Catholics have not been able to do it because too many of them think it cannot be done and should not be done. It is not just a matter of having different ideas about what to propose. There is this too, but by now it is a matter of no longer retaining that Catholics as such must, may and are able to make a proposal. It is also a matter of a theologically well argued dissertation. […] This has caused discussion groups to more or less fail; produced documents propounding ambiguous compromises, which were soon shredded by the mass media machine, leaving nary a trace; made people forget that “everything is linked together”, and thereby causing them to lose the habit of thinking in terms of the whole picture rather than individual pieces of it; led people to adopt positions typical of Christ-less civil ethics, further secularizing the Catholic faith and bringing about the wasting away of what it can contribute to the political arena in specific terms; gave people the illusory perception it was suitably present only by humanizing the projects of others, projects which in the meantime had bid farewell to humanness” (pgs. 9-10). If this picture depicts the current point of departure, it is necessary first of all to start anew from the selfsame reason that gives sense and motivation to the presence of believers in society, that being evangelization and the witness of the liberating truth of Jesus Christ, which is exactly what has been lost today: “social ambits are mutually going adrift and people find it difficult to see how the moral resilience of society might have a direct relationship with the upturn of the economy, or how the ability of the school system to educate and not just instruct might have a concrete link with the labor market and economic revival” (pg 14). Despite everything, many people, all too many people, still think that labor has nothing to do with the Truth, and that research, whether academic, economic, medical or scientific, can achieve the good of society on the basis of self-determined and discretionary rules. This holds true in general terms, but now more so than ever before also and especially for Catholics, who, in the wake of the historical heyday of the Christian Democratic Party, have seen their representatives join all kinds of different parties, with misleading and at times embarrassing results: .“The fact of the matter is that the presence of Catholics in the various political parties has produced two negative effects: the heightening of cultural and political differences among Catholics and indifference when elections take place. The first effect comes across in the political attitude of Catholics also in the face of laws that most evidently threaten human nature. This attitude differs considerably, and it has become impossible to construct and implement a common praxis, even in Parliament. The second negative effect has to do with elections. When deciding on how they should vote, a good portion of Catholic voters focus more on the candidate than the party, more on personal honesty than on a political platform, and more on the things to do than on the benchmark culture. In the long run this leads Catholics to become unaccustomed with reasoning “as Catholics”. People end up no longer believing that issuing forth from the faith and the Social Doctrine of the Church may be a culture, a form, a Catholic vision of politics. What thereby happens is that the Social Doctrine of the Church is reduced to a series of ethical recommendations able to animate and mobilize political affinities which may well be very different or even opposed to one another. Or else this doctrinal corpus is reduced to a series of teachings which are taken on by each party in a piecemeal fashion, and hence unable to foster an organic political vision” (pgs. 27-28). The antidote to this situation has obviously been suggested by the pontiffs themselves if we but limit our considerations to documents such as Veritatis Splendor, Evangelium Vitae and Spe Salvi, which constitute an ideal and substantial framework for the so-called ‘non negotiable principles’. It is on the basis of respect for their criteria that all the rest is gauged, and, in the case of Italy, this above all means revisiting the issue of the freedom of education, which, although formally sanctioned by the Italian Constitution, has never really been put into practice ever since the end of World War II. Moreover, linked to this are also other core issues regarding “being in society “on the part of Catholics”: the fact that there is an autonomous civil society before the ‘State’, and therefore ‘pre-juridical’ rights to be recognized; the fact that ‘public’ is not a synonym for ‘state’; the fact that the liberty of the family comes before any decisions made by the Minister of Education; the fact that it is difficult to affirm any real sense of authority if destroyed at its very roots is the first authority a child sees in the world, that being parental authority. Then again, and in a broader and more articulated manner: the judgment on the historical parable of modernity, which isn’t always marked by “magnificent and progressive outcomes” (it was with the French revolution that states began expropriating schools from religious orders, nationalizing them and thereby radically monopolizing education), and the selfsame notion of public school in a pluralist society (for example, can the school system attend to the themes of the truth and the absolute, or must it simply limit itself to voicing generic philanthropic exhortations to be nice to one another?). 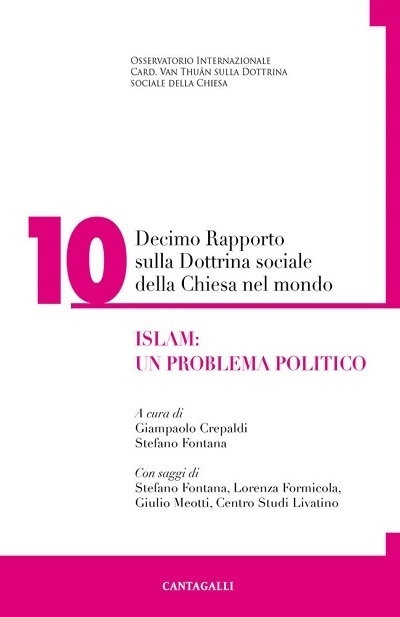 In addition to the school system, still to be tackled is the burning issue of the plummeting birth rate, “which is the true problem of Italian society” (pg. 81), since for some time our country has been close to the bottom in the annual birth rate classification of nations. In one way or another this will mark the construction of the future society (which means more or fewer immigrants, more or fewer natural families, more or fewer singles and common law couples). Nonetheless, precisely because we are Christians – and hence men and women who cultivate the theological virtue of hope day by day – and also because our destiny is yet to be written, we remain linked to that idea of ‘Italian exception’ so resolutely transmitted to us by St, John Paul II from the very outset of his lengthy pontificate, recalling on numerous occasions the special characteristics of vitality that have marked the recent and not so recent history of our country: “Despite everything, Italy is still in a situation unique in many ways, with its own potentials and resources that still have not been lost. In our country the past is not completely over and continues to act as a source of light for the future. Life styles have broken asunder, but the family strives to resist. Despite countless difficulties, dangers and the speed of change, yet to be seen is the negative acceleration imposed in other countries by a spate of short-sighted laws. The social disruption phenomena indices are increasing more slowly than in other countries. The decline in matrimonies and the increase in births outside wedlock reflect expanding phenomena, but have yet to become generalized. The family continues to be the place of savings, the primary welfare net and the secret banker. Attention to the education of children and relations among generations are still strongly felt, even though deep cracks are appearing on the horizon as families become smaller and the number of single parent households increases. Artificial insemination, assisted procreation and surrogate maternity are still phenomena circumscribed by legislation among the most restrictive in the western world, and which defines a phase of positive slowdown that makes new battles possible, while other nations have raised their hands on high and surrendered to newness” (pgs. 19-20). Ptheology according to Massimo Borghesi. Select critical clarifications.